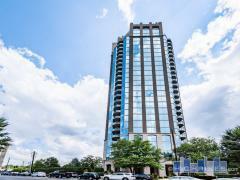 10 Terminus Place has quickly become one of the most coveted Buckhead buildings. These units have timeless style with undeniable modern sensibilities, and they come in sizes to suit every buyer, from studios to 3-bedroom homes. 10 Terminus is a mixed-use development with a prime location at the corner of Peachtree and Piedmont roads in Buckhead. Towering at 32 stories, this community will combine high-rise residences with upscale boutiques and four-star restaurants. Condos are equipped with top of the line appliances and amazing views and the building boasts all the best amenities. Listing information last updated on April 24th, 2019 at 6:30am PDT. Have any comments or questions about Terminus Place Condos? Ask your question and/or share your thoughts about this Building.